The Evangelical Congregational Church was the successor of the Second German Congregational Church that was organized in 1913. The last service at the Second German church was held on the last Sunday of April 1961. 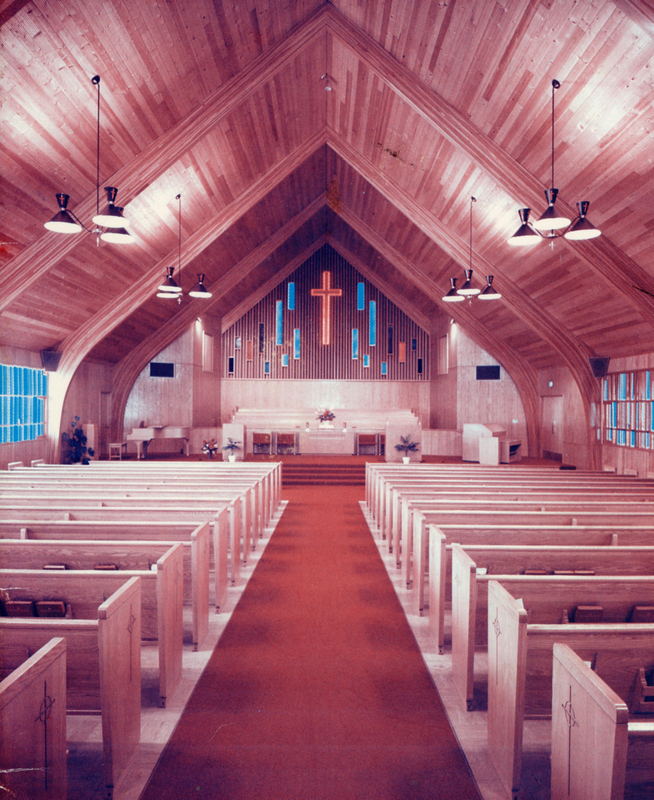 During construction of the new church, regular services were held at the Cascade College Chapel. Architect Don Eby of Vancouver, Washington (the founder of LSW Architects) was hired to design the new church building which is located at NE 55th and Alberta. 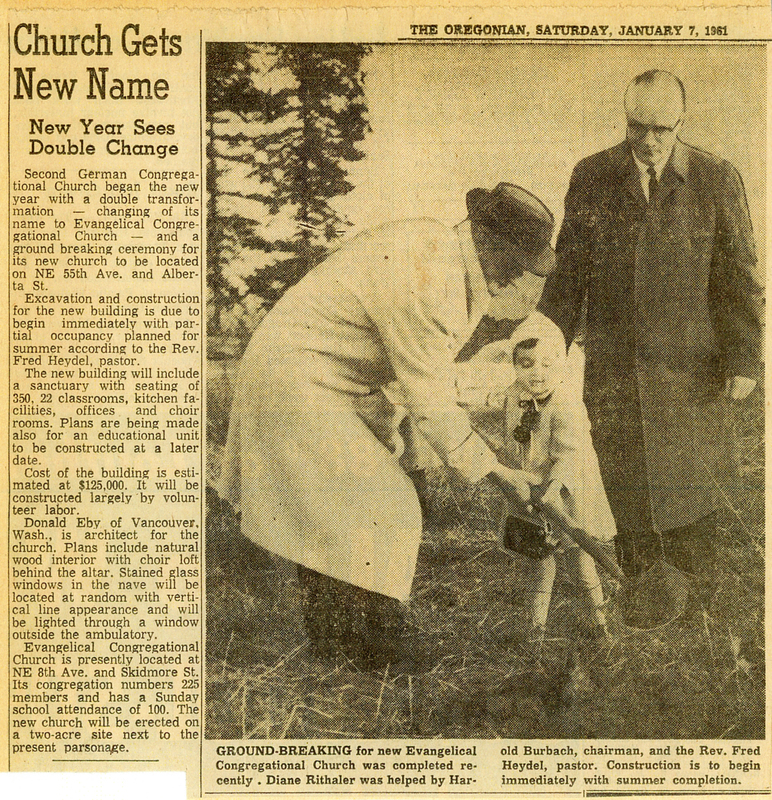 A groundbreaking ceremony was held in January 1961. It was a momentous occasion held on a beautiful sunny day in the midst of a season of inclement weather. The congregation was blessed in obtaining materials that were used in building the new church. Many materials were donated or obtained at below-market prices. Under the direction of Harold Burbach, who sacrificially served as general contractor, men and women of the church labored together to erect a new house of worship. Skilled craftsman helped with the carpentry and woodworking. Other people volunteered and took vacation time from work to hang sheetrock, lay floor tile, install roofing and paint the many rooms within the complex. Because of the donated labor hours and materials, the total cost of the facility was held to just slightly over $150,000. In comparison, the lowest outside bid for a contractor was $300,000. The new church was substantially complete and ready for occupancy by September 1961. A dedication ceremony was held on October 8, 1961. The Rev. D. K. Schmidt of Walla Walla, Washington spoke at the morning service, and the Rev. James Hagelganz (the grandson of Rev. Heinrich Hagelganz) addressed the afternoon service. By a vote of the congregation, the name of the church was changed from the Second German Congregational Church to The Evangelical Congregational Church. There were approximately 225 members in 1961 with a Sunday School attendance of about 100. At this time all church services were conducted in English. Following the counsel provided by Rev. Hagelganz before his death, the church voted not to become part of the United Church of Christ. The membership instead chose to remain a free and independent Congregational church. Rev. Heydel had led the transition from the old church to the new. In March of 1963, he accepted a call from a church in Kulm, North Dakota. He was the last bilingual pastor of the congregation. Installing the cross outside the new sanctuary of the Evangelical Congregational Church. Following the departure of Rev. Heydel, an interim minister, Rev. John Groenland served the congregation until 1964. Rev. Groenland was part of the Multnomah School of the Bible staff. His clear-cut preaching was a departure from what the congregation was accustomed to hearing. When his interim service ended, the congregation made a call to Rev. Melvin Dahlstrom from Seattle, Washington. Rev. Dahlstrom accepted the call and with his wife Aina, the Dahlstroms were installed on Palm Sunday, 1964. Rev. Dahlstrom was known for his passionate preaching and strong emphatic style reminding many of the founding pastor, Rev. Heinrich Hagelganz. During Rev. Dahlstrom's pastorate, the church hired its first youth director in 1965. John Longley, who moved to Portland to serve as rally director for Youth For Christ, first served as choir director and organist. His enthusiasm for working with young people led his efforts to found a successful youth program. A final payment was made on the church mortgage and a mortgage burning victory banquet was held in the Fellowship Hall in October of 1967. The total debt had been retired in less than eight years. In 1968, physical improvements were made to the church with parking lots being blacktopped and the parsonage being completely renovated. Rev. Donald Bletscher was called to serve the congregation in May 1969. Rev. Bletscher and his wife Clara and son were welcomed to the church on August 10th with a special installation and fellowship dinner. Pastor Bletscher served until August of 1980. During his eleven years of service the church enjoyed growth in its music ministry and youth programs. Special musical presentations with drama, pageantry, theatrical lighting and orchestration under the direction of Ruth Schunke and her son Jay were events to be remembered by all. With Rev. Bletscher's resignation in 1980, the membership asked Rev. John Schneider, who had served as youth pastor, to consider the position of senior pastor. Rev. Schneider accepted the invitation and the church welcomed John, his wife Sandy and their three children on November 2, 1980. As the youngest man to serve the congregation his challenge was to bridge generational gaps with traditional thinking at one end of the spectrum and revolutionary ideas at the other. Rev. Schneider successfully served the congregation until 1994. Rev. Gary Shank served as Minister of Education under Rev. Schneider and was called to serve the church after Rev. Schneider's resignation in 1994. He served until 1995 and was followed by Rev. Dan Merrill from 1996 to 1997. The church was renamed as The Central Evangelical Church in 1996. Rev. Raymond H. Maier served as interim pastor of the congregation from 1997 to 1999. Rev. Maier was confirmed in the Second German Congregational Church providing historical continuity for the church. In 1998, the church celebrated its 85th anniversary. Rev.Tom Lyman was called to be an assistant to Rev. Maier. Both interim pastors guided the congregation through the process of deciding if they should join the Free Methodist Conference or to remain independent. The congregation again voted to remain independent. After the resignation of both interim pastors, Rev. Lyman was called to serve as pastor. Rev. Lyman served from 1999 to 2005. In 2003, Rev. Doug Frazier, pastor of Northeast Community Church became co-pastor with Rev. Lyman. The church was renamed The Word of Life Community Church at that time and celebrated its 90th anniversary. After two years, Rev. Frazier resigned to accept a position in the ministry of “All God’s Children” an organization which his wife’s parents had founded. Pastor Tom Lyman continued as pastor for another 6 months. Rev. Randy Pearson received his Master’s in Religious Education from Southwest Theological Seminary of Fort Worth, then was pastor at a church in California. After moving to Salem, Oregon, he worked part time as a substitute teacher in elementary schools. Rev. Pearson preached the Sunday morning message for six months before he was called to be the pastor. The installation service was on August 1, 2006. Rev. Pearson and his wife Helen ministered for almost four years before accepting a call to the Grace Baptist Church in Portland. Over the years, descendants of the founding families and those who joined the church in its early years continued to assimilate and move to other parts of the city and the country. Only a few of those with Volga German ancestry remained in the congregation, including Joanne and Willis Krieger. Teh grandfather of Willis, Melchor Krieger, was a founding member of the church in 1913. After nearly 100 years, the last service for the church was held on Easter Sunday, April 24, 2011 - exactly 50 years from the last service held in the original sanctuary at NE 8th and Skidmore. The church property was sold and the congregation disbanded. On June 22, 2013, a 100th Anniversary Celebration was held for former members of the church at the church building on NE 55th and Alberta. A tour and program led by Dr. James Hagelganz was also held at the old Second German Congregational Church building on NE 8th and Skidmore.